"Looking for ways to get turmeric into your diet in a way that makes it available to your body? 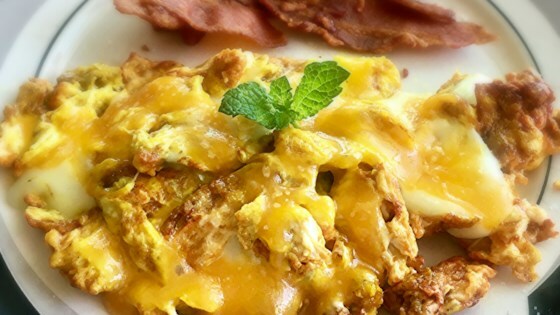 Try this simple yet bold recipe to flavor your morning eggs! Simply turmeric, oil, eggs, cheese, and lots of ketchup if that is your thing like it is for me!" Warm canola oil in a small skillet. Stir turmeric into oil; immediately add eggs. Pour in water; cover and cook until firm, 2 to 3 minutes. Flip eggs and lay Cheddar cheese on top. Cover until melted, about 1 minute. Add ketchup.